From social robots to drones and fears of job displacement, a common theme in this week’s robotics roundup is the need for robot design to account for the human factor in user interfaces, applications, and skills retraining. Not only should good robot design include a device’s capabilities; it should also account for technical limitations, human end users, and innovative applications. 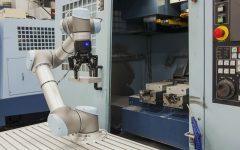 Robotics Business Review has partnered with me to bring you a weekly roundup of the top robotics developments. This week, we look at why natural language processing should be a priority and how merging mind and machine creates new possibilities for companies. Are you ready to be updated? One challenge facing humanoid robots is that, as they more closely resemble us, we expect them to be as smart as us. A Chinese robot called Jia Jia recently illustrated this point during an interview with Wired. Unfortunately, it struggled with providing detailed responses to questions in English. Jia Jia looks realistic, but its natural language capabilities are still limited. Jia Jia took three years to develop. While the social robot’s exterior looks human-like — its design is based upon five different women — it lacks the basic ability to communicate with human beings, the core of its job. This limitation isn’t unique to Jia Jia. Whether they’re on the factory floor or in a busy shopping mall, robots’ ability to communicate with humans will be more important than how they look or move. Yet many of the robots being deployed in social settings are still extremely limited in their ability to talk normally. Businesses working on robot design often focus on new energy technologies or advanced guidance systems. However, they shouldn’t overlook the need for natural language processing and user interfaces appropriate to their environments. A student at a high school in Tanzania has independently built a simple robot that relies entirely on solar power. The robot’s components cost him $89 and is made from tin boxes, metal pieces, and other “local materials.” Also installed is a chip that allows the robot to talk and sing. This East African innovation is further evidence that robotics isn’t just a “top-down” industry where giants like KUKA, ABB, and Rethink Robotics dominate the global market. A strong and growing grassroots maker community is emerging, and it could transform robotics around the world, especially in Asia and Africa. Also noteworthy is the improving ability to harness solar power for the next generation of robots working on farms, roads, harbors, or in the air. Yesterday, grassroots robot design took cues from industry leaders. Tomorrow, will it be the other way around? Alibaba is an investor in SoftBank Robotics’ Pepper service robot. Jack Ma, the billionaire chairman of China’s Alibaba.com, made headlines recently when he said that robots could replace humans as the next CEOs of businesses in the coming decades. While it’s easy to dismiss his comments as outlandish, there’s more to Ma’s comments than meets the eye. Businesses of the future may have a different structure than what we see today. If AI is being used beyond completing tasks, it could become the overarching “boss” across the many divisions of a company. Last year, McCann Japan said it would appoint AI-CD B, an AI, as one of its creative directors. (The project was led by millennials.) If the advertising agency has more AI creative directors than humans by 2020, who will be driving its campaigns — robots or humans? Boxed Wholesale is an e-commerce site that allows you to order bulk items cheaply — like an online Costco, without the membership costs. This week, the company announced that its fulfillment center in New Jersey will be completely automated. Boxed said its employees will be re-tasked to other jobs, such as servicing or troubleshooting, and their pay could rise by up to 13% on average. Companies around the world are doing the same thing as Boxed: automating one area and moving employees to other areas. Robotics and AI aren’t limited to one set of tasks, so moving employees from division to division won’t solve automation-induced job losses; it only prolongs them. 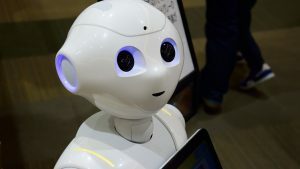 Instead, businesses need to focus on the new jobs that are going to emerge as a result of robotics and invest their time in helping employees attain the needed skills. Many companies must also accept that automation could make many of their employees completely redundant. This puts the onus of “staying relevant” on people, not companies — a reality that has existed for decades but is only sinking in as the age of automation becomes real. Shenzhen Dajiang Innovation Technology Co., the world’s largest drone maker, has unveiled DJI Goggles. These are goggles that give owners of certain DJI drones, like the Phantom 4 (see image above), the ability to operate them in a first-person view. The use of remote bodily motions, virtual reality, and augmented reality will likely grow as ways to control robots and drones. 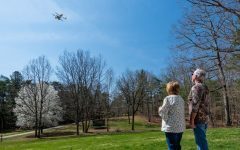 DJI’s Goggles are a hobby accessory, but they point to a new way of connecting humans with machines. Instead of having a remote controller or a smartphone app, why not integrate functions during robot design into the movement of your head or limbs? Telesurgery and remote unmanned vehicle operation are already spreading, but where else could this technology be applied? What if robot chefs, such as the one from Moley Robotics displayed at Hanover Messe this week, allow someone remote like a relative or even a human chef to prepare meals? As robot design includes ever more advanced hardware and AI, robotics makers and end users will distinguish devices by their innovative applications.